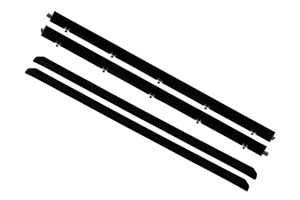 Protect your vehicle’s interior from the outside elements and reduce noise level while driving simply by replacing your dried-out or cracked weatherstrip with a proven product that’s accepted in the industry. These beltlines are made from the OEM specs to install and fit for an authentic appearance. The beltlines mount on the top inner and outer part of the door to squeegee the door glass. The outers attach with the pre-applied clips and the inners attach with staples or rivets (not supplied). This is a 4 piece kit for both driver and passenger doors.